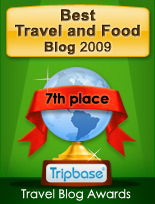 To make it easier for you, I have compiled all the rated restaurants on Enjoy Food & Travel for the year 2009 on this page. Enjoy!! Winstub Au Clou is no tourist trap. 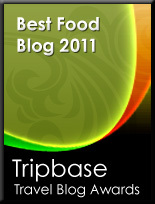 Top rating due to location, great interior and atmosphere, excellent service and first course. Main course disappointing, but I feel an encore possible, as it may have a few culinary treasures in store for future visits. We left completely satisfied. Absolutely one of the best experiences in Sitges. Highly recommended by Enjoy Food & Travel. Great traditional food and wine at a restaurant with great character. Highly recommended in downtown Oslo. A must for those of you that want to enjoy traditional Scandinavian cuisine. High scores on location, interior and service, and NOK 398 for this meal is very favourable. Personally I found the six course to be a culinary roller coaster. It went from exquisite to mediocre. I would still recommend tabibito for an evening dinner. I would, however, compose my own dinner instead of choosing their menu. Still a recommendable place to enjoy the traditional Danish specialty. A little low on taste this time, but the open sandwiches served are still a feast for your eyes, and you get topping in abundance. Very high standard on food (4,86 points), but the moderate score is primarily due to low accessibility, as you will need a car to visit Scituate. The food at Riva is probably one of the best experiences of the last year. I will look forward to another visit. One of the best meal during our week on the Canary Island. Great location, but the terrace was overcrowded. Great, tasty seafood meal accompanied by delicious cold white wine. A climb down from the review in 2008. Even the gnocchi ordered by my traveling companions were of completely different character. Pizza was dry and not very good. Location, atmosphere, service and price saves it from even a lower dip in rating. A great place, sadly nearly out of bounce for those depending on public transportation. Good quality food served at a good price. If staying in Scituate a meal here is recommended. A great place for a bite of traditional food in a rustic interior. in downtown Bergen. Extraordinarily delicious Christmas plate highly recommended by Enjoy Food & Travel. Sadly the rating could have been so much better, as the service was appallingly bad. Lunch served on the pavement, with city traffic roaring only yards away. Decent service, but definitely the place for excellent Spanish tapas, offered at ridiculously low prices. Low on interior and location, but definitely the (and only) place for Danish grub in the neighbourhood. One of the best options at the Playa, good service - and open sandwiches. An overall good French bistrowith a charming traditional interior in downtown Göteborg. Overcrowded when we visited it, affecting the service. Too many tables made it very uncomfortable. Located outside Boston, you HAVE to have a car to visit the Rustic Kitchen at Derby Street Mall. It is therefore out of bounce for those of you visiting the city. Quaint interior. Delicious Lobster Club is a delicious treat, and this dish sets a high standard, and if the other food on the menu is as good as the club, then this is a highly recommendable place to eat. Great interior left after 300 years of history. Definitely a place to drink, but if you want to eat, go next door. At Skindbuksen you can indulge in the true Danish open sandwich experience. Hviids vinstue is a place to drink, nothing more. Great location, good beer, medium service. Very uneven quality on food. I will never return here to eat!! Totally tourist trapped in Nyhavn. Read my warning on where not to eat, and you will find that Nyhavns Færgekro had many warning signs, that I did not see. If dining in Nyhavn, check where to eat. Café Zeleste is the one I would recommend. Hardly a place that would please the noblesse, or ordinary food lovers, for that matter. The only decent thing was the food, and it would have been even better if it had been warm. I have enjoyed decent dim sum and Beijing Palace, but my latest visit was a disappointing experience. If this is the overall level, I cannot recommend a visit here. Venus Delicatessen provided the worst culinary restaurant experience in 2009. The 3 B's is due to location and price. The food was terrible, the interior looked worn and decayed. This is certainly a place to be avoided if looking for a late night snack. One of the places that I dream to dine, is in Paris. In Rue de Montmorency in the Marais district you may eat in a house that once belonged to one of the greatest alchemists in the world - Nicolas Flamel. This is a café with so much personal sentiment connected to it, as it has been there during my 21 years visits to the Harvard area. If you plan to book a table at Bagatelle, Oslo's only two star Michelin restaurant, you may be too late. It will close down December 21st due to a conflict between its owner, investor Christen Sveaas and Eyvind Hellstrøm, its founder and head chef. First day - after lunch hunger!! We had a stroll to find a place to eat, and ended up at El Jabali after we had walked around the block. Last September I spotted the impressive sign outside Bartley's Burger Cottage. I love old taverns, and in Copenhagen they are out of numbers. At Kultorvet, or the coal market you find one that has be open for business over 200 years. 1807 was a turbulent year. I sat down at Le Roi et son Fou (The King and his Jester), a small bistro, looked over the menu and found just what I wanted - a sandwich with jambon or ham. Mediterranean culinary traditions and culture differs greatly from our Scandinavian. You are sometimes served the most unexpected foods, and we were slightly surprised at another small tapas bar in Ronda Sant Pau. I and Enjoy Food & Travel co-writer Susanne Koch met for an after work snack last Friday. We were both craving for sushi, and after a short deliberation we decided to visit Nodee. Alsace is widely known for its pies or quiche. The neigbouring province, Lorraine, has even one named after it. At place Gayot we found Restaurant La Table du Gayot, a small tavern and bar, and we decided to order to try one type of this Alsatian specialty. Every year I visit my cousin in Salisbury, we order takeout pizza from Salisbury House of Pizza. There, they really know how to prepare this American-Italian specialty. Sigtuna is a quiet, quaint town an hour away from Stockholm. This hamlet is, however, another world compared to the busy suburban life. This is felt clearly when you enter the backyard of Tant Bruns Kaffehus, located in the oldest building in the town center. A nice place if you are in the mood for Chinese food. An informal Chinese restaurant in the heart of Harvard serving the most delicious food. If you are looking for Z-Square at 14 JFK Street, you will search in vain. This place is out of business.